As much as I always love it, reading Lewis occasionally reminds me of how I’m so deficient in “the literary canon”—the great pieces of literature that everyone has read; a.k.a., the books I should have read already. All too often I’ve found myself smiling and nodding at faculty teas and evening soirees as the conversation urbanely turns to Kafka or Flaubert or Steinbeck. I’ve become quite adept at changing the direction of conversation to something I’ve actually read—typically from the snatches of contemporary lit fiction I’ve ripped off of the Giller long list or the Man Booker nominee sheet. Usually this works, and I’m saved from being exposed before my peers as someone who has gaping holes—in the literary world, we would say “lacunae,” to sound more literate—in his foundational reading. But this deficit is absolutely real, and partially intentional: I would rather read something that’s received the Newberry Medal for children’s literature than something that won the Franz Kafka Prize for pretentious literature or the Ovid Prize for inaccessible poetry. I love the nonsense poetry of Shel Silverstein and the speculative worlds of Terry Pratchett and the crisp prose of E.B. White. I’ll soak in artists like Paulo Coehlo and Chaim Potok and Jane Austin, but I also love pulp fiction from J.K. Rowling and Phil Pullman and … gasp … Stephen King. I’ve been reading the Lemony Snicket series with my niece, and we are delighted to read together the thirteenth and final volume—books designed for a book-devouring nine-year-old and a thirty-something fan. I love all these authors because they write great books. Still, I occasionally look longingly at these “Top One Hundred” book lists to see how I’m charting on my canonical readings. I posted one of these lists on facebook, this one from BBC, and found that I had read only a quarter of the books. As my friends and I were discussing what we had read, I hesitated to say that I had seen some of the movies. In fact, I had precisely doubled my foray into great literature by seeing their interpretation on stage or on film. To me, this was somehow cheating. And that brings me back to Lewis—or really, to Bunyan. When I read Lewis, I am constantly aware of how little that I’ve actually read. Lewis read almost everything, and remembered most of what he read. This great baptism in the imagination of all those who had gone before fills his writing. Usually, we can navigate his books easily without knowing who he loved to read. 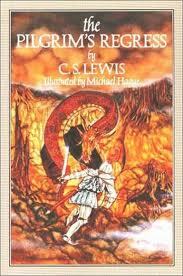 We can read Narnia without knowing George MacDonald and J.R.R. Tolkien, though these gentlemen shouldn’t be missed. And we can read his apologetic works—Mere Christianity, Miracles, and The Problem of Pain—without knowing G.K. Chesterton. Though you need to have Milton’s Paradise Lost in order to really get Perelandra, The Great Divorce is a brilliant read even without an education in Blake. The experience is richer when we’ve read some of what he’s read, but Lewis’ popular works are impressively accessible. But there is one place where I’ve discovered that I’m swimming in the deep end of the literary pool: C.S. Lewis’ first Christian work, The Pilgrim’s Regress. This allegorical travelogue charts Lewis’ journey from nominal church kid to atheist to pantheist to theist, and then finally from being a theist to being a Christian. The entire narrative is in the form of a dream sequence, where the pilgrim—John, an everyman cipher of Jack, Lewis’ nickname—wanders through an enemy-occupied land on an odyssey toward an Island. This Island appeared in his imagination as a scent on the breeze or the slightest hint of a song in the evening, and captures the longing of the pilgrim to be drawn toward God—the landlord that created the land in which he wanders. John never finds the Island—it doesn’t exist in the strict way we imagine existing—but the overwhelming beauty of the Landlord makes him realize that he was never looking for the Island to begin with: the longing for the Island was really, all along, longing for the Landlord. I understood much of the story of The Pilgrim’s Regress, though some of the philosophical moments are lost in the cultural feeling of Lewis’ day. But as I read, I had the sneaking suspicion I was missing something—not so much the words, but the form, the shape of the narrative. I’ve read lots of travelogues—I loved Miriam Toews The Flying Troutmans, for example—and have written two myself. But with the great caverns of my literary landscape I am missing the great trinity of pilgrim journeys: I’ve only skimmed Homer’s Odyssey, I’ve avoided Dante’s Divine Comedy altogether, and Bunyan’s Pilgrim’s Progress—well, Bunyan is another story. With Bunyan, I cheated. It wasn’t a bad cheat. I was in my first year of college and recruited into the ranks of the choir. Not long after joining, it was evident I could not sing very well—a slight problem when one is in a choir. When a musical adaptation of The Pilgrim’s Progress was chosen as the stage play for the choir, it is no surprise that I was selected as the only non-singing role: that of Christian. Researching my role, I decided to read John Bunyan’s original work. I retrieved a copy from the recesses of the library, blew off the dust, and sat down to read it. Three pages in, wading in arcane prose and allegorical imagery, I set the book down and chose to read the The Pilgrim’s Progress: A Graphic Novel instead. For some reason, the Marvel Comics version was easier to get. So I’m missing Bunyan, Homer and Dante, for the most part. And in missing these folk I feel that longing to fill in some of the holes in my literary education. As a result, I’ve set Bunyan’s magnum opus on my bedside table—the full version, not the graphic novel, though this edition has beautiful oil painted illustrations and was presented to Dottie Diamon by St. John’s Church on Christmas 1934. Perhaps she read it before putting it in a yard sale one Saturday, where she may have picked up a far more accessible book, like The Lion, The Witch, and The Wardrobe. But I’ve also taken a second look at that BBC Top One Hundred Books list. Interestingly enough, Bunyan isn’t there. Neither is Milton, or Homer for that matter. Perhaps the image of a “canon”—a “ruler” used for building something, in this case a prescribed list of books we need to have already read to build an educated mind—is the wrong metaphor. Maybe “landscape” is a better image, so that our reading is less like building a house and more like going on a pilgrimmage, an odyssey, where the reasons for beginning the journey are lost in the overwhelming beauty of the destination: the discovery of great books. This entry was posted in Reflections and tagged Blake, C.S. Lewis, Chaim Potok, E.B. White, Flaubert, George MacDonald, Giller Award, heaven, hell, Jane Austin, Kafka, Lemony Snicket, Newberry, Paulo Coehlo, Pilgrim's Progress, Pilgrim's Regress, pretentious, Shel Silverstein, Steinbeck, Stephen King, Terry Pratchett, Tolkien. Bookmark the permalink. I can send you an explanation of the Dante structure in Pilgrim’s Regress if you like. Sure, I’d love to see that. I’m finishing Bunyan now and moving on to reread Regress by Lewis. I’m at junkola [at] gmail [dot] com.